Applause and cheers erupted as the screen faded to black. The fanfare was well deserved: over the past four weeks, 20 young refugees produced four films each with a different storyline—but with the same powerful message of strength. Inside Zaatari, a caravan was transformed into a cinema for the debut of their films and a celebration of their hard work, talent, and their bravery to use their voices to break down walls and build hope. A group of 17 boys—the youngest 10, and the oldest 14—gather their chairs around three tables. They sit in a classroom and although they are not in school, most of them did attend school when they were home in Syria. 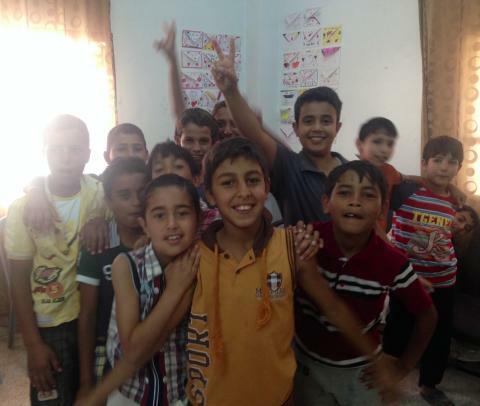 Now in Jordan, education seems like a fleeting dream. One by one, each boy stands up and shares why he is not attending school. Tomorrow is World Refugee Day: a day set-aside as a call to action to respond to the needs of those displaced from home, including over 2.5 million Syrian refugees. Awareness is important—crucial even—in the presence of a crisis.